I'm always up for a good challenge! I've been pondering this module set for a while now. It's going to be a pretty big project, but what the hay! Let's do it! 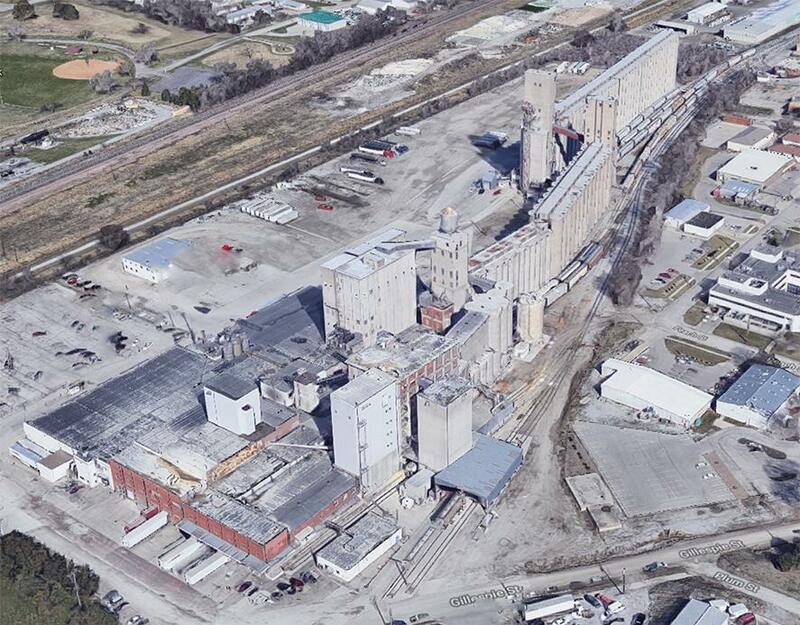 This is the Gooch Milling and Elevator plant, covering about 20 acres here in Lincoln. It is located a little ways south of Hobson Yard and the Wye under the Rosa Parks Way overpass. You can see the double track mains across the top left, with the plant tracks cutting in a bit out of picture to the top. And here is the module designs. Practically everything on this module will have to be scratch-built and I plan to use the Silhouette and Photon heavily. In fact, I may even buy a laser cutter for this one as well! Ok, put the mill complex back on hold. Here's another one I've been thinking of lately. Emerald Nebraska is just a few miles west of Lincoln. The town itself is unincorporated; little more than a diner and a gas station. 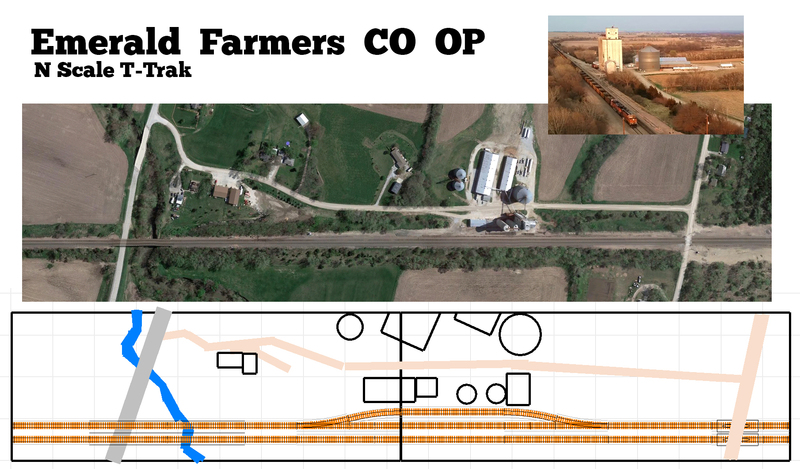 But there is a large Farmers CO OP that offers pretty good railfaning too. Why T-trak instead of Free-moN? 1. It will give me something to play with while the Free-moN layout is all packed up between shows. 2. It will be used as a vendor display for 3D printed models. 3. It will be a practice/pre-build for Emerald the Free-moN module! I would suggest avoiding the drop frame idea unless you plan to clamp that module to the table at both ends. One of the bigger issues we deal with on our T Trak setups at shows over the course of a weekend is people bumping the tables and shifting them out of alignment. Thanks for the insight, good to know. 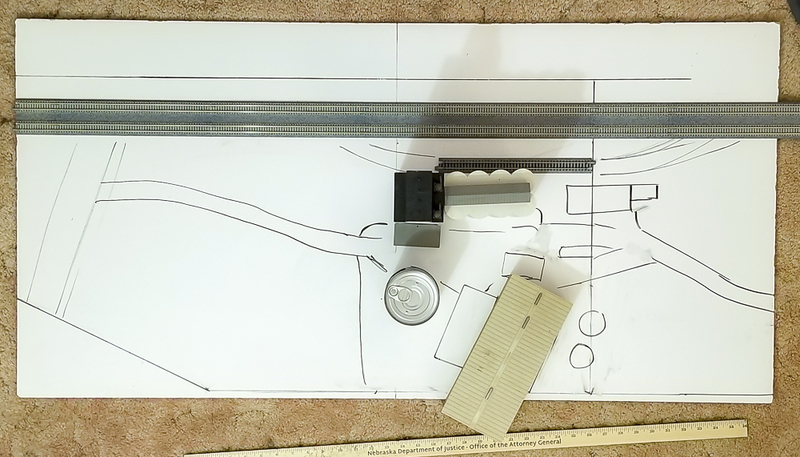 This weekend, I'll do some paper mockups to see what the elevation differences would look like in tangible form. Another thing I've been pondering is the orientation itself. As drawn above, the elevation drops off quite a bit toward the backdrop. Ideally, the tracks would run along the backdrop and the scene would rise up into them from the foreground. I would prefer that orientation much more, but then I'd have to get creative with the two flat storage buildings. Well I'm still torn on whether to go with the drop-frame module or not. I made a mock-up, but it didn't help my decision at all. Did some more blocking today by plotting out dimensions and laying out some stand-ins on a white board. 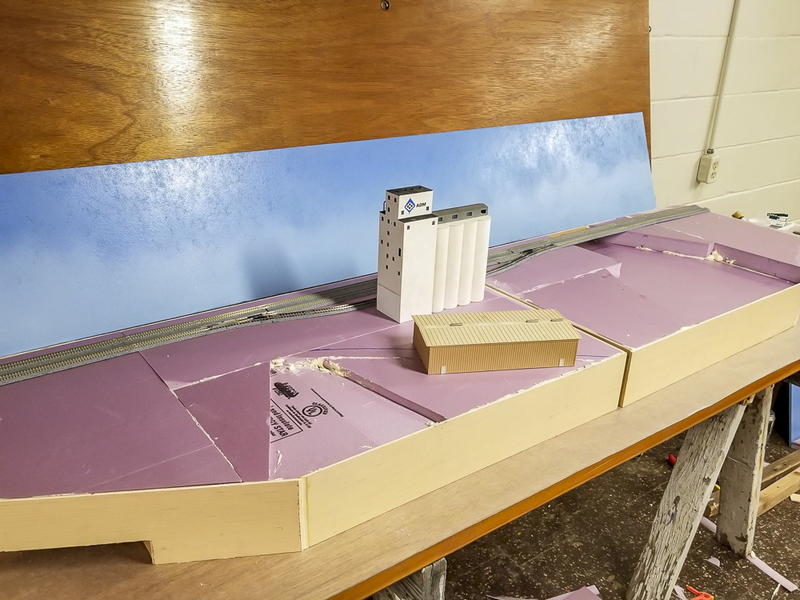 I'm making this an extra wide set to accommodate the flat storage buildings (the two buildings will be bashed from my too-big single building there), and 'track-at-the-back' since most of the terrain is below grade. The standard endplate will remain 14" and taper out to 20". Based on my soup-can, everything should fit just right! 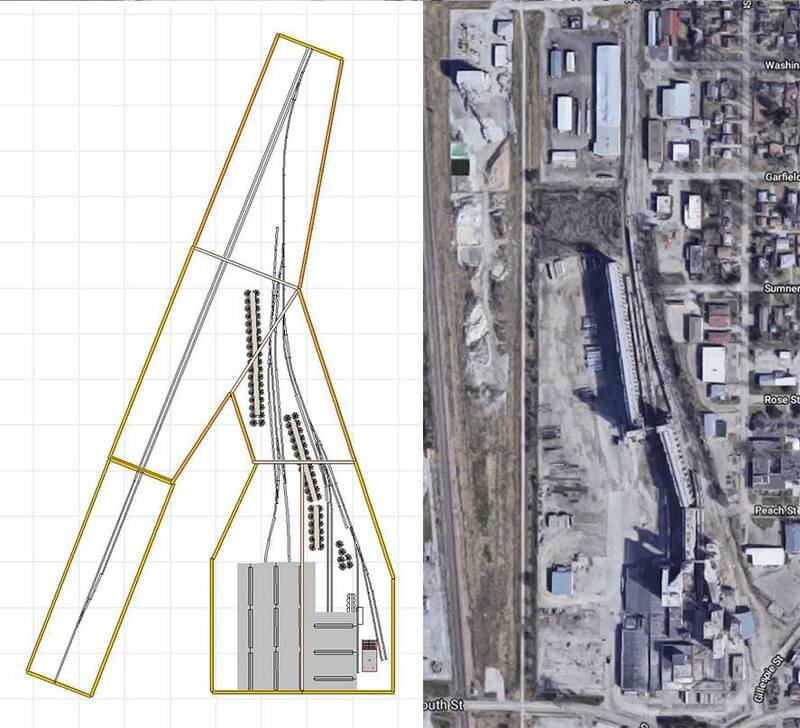 Official construction is set to begin this weekend! That's going to look good! Framework is cut and ready for the weekend! This is one of my favorite stages of module building as it means we're on the pad, everything is a GO, and we're ready to launch! I dig... I loves me some table saw time! Go man, GO! Framework is near complete. 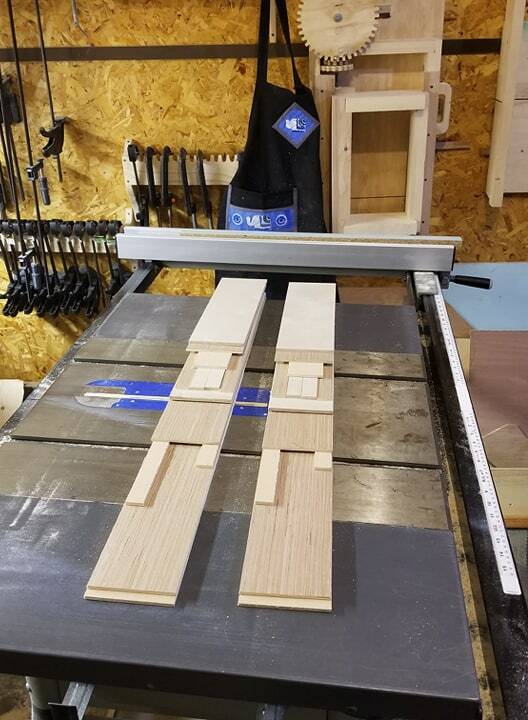 One more board to glue up on the far module, and one notch to cut out on the near module. 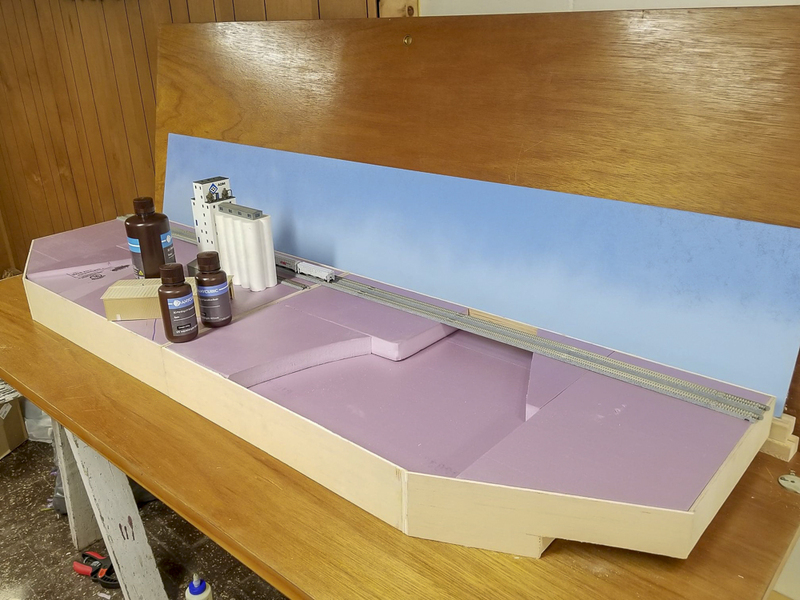 Next step will be gluing the foam in with Great Stuff and then the real fun begins; carving terrain! 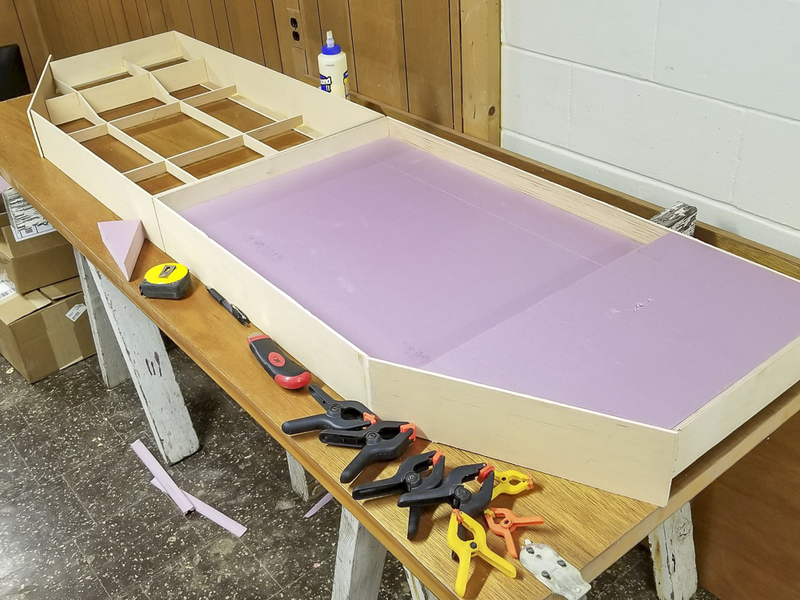 Last update we left off with frames built and ready for foam. Now we have foam in and ready to carve! 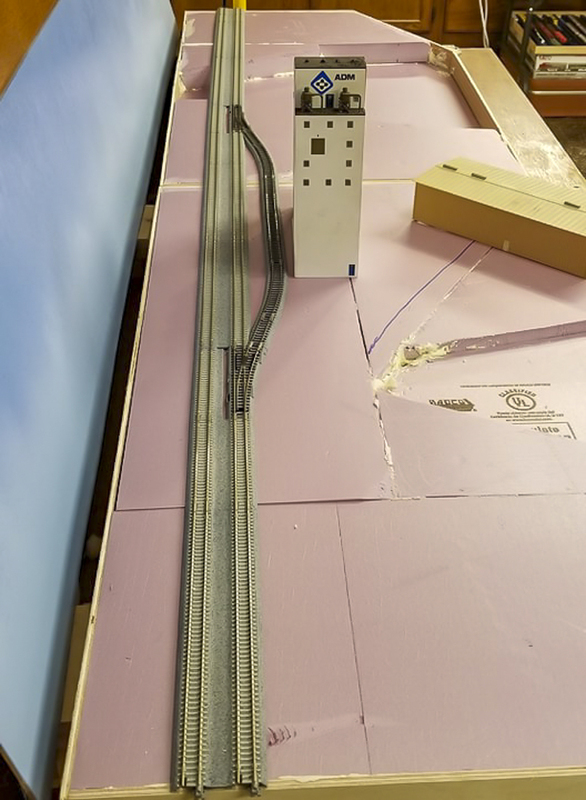 Here's everything test fitted, minus turnouts. And here's everything glued in, with turnouts. Uh oh, there's a problem with these #4s! Turns out they're 2mm longer than the standard 124mm section. 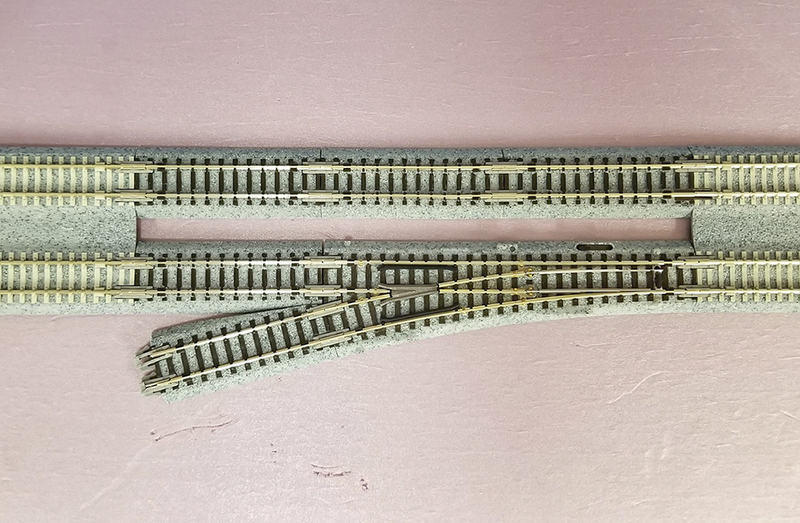 Looking closer, it looks like I have to use the other wood tie sections on the other mainline to match the length of the turnout?? 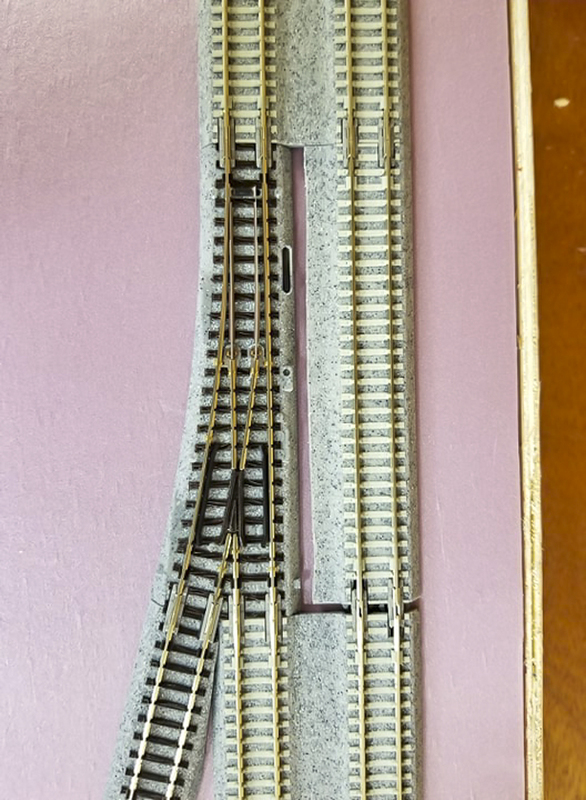 So not only does it look stupid, but that means I cut my 124mm double track concrete tie section apart for no reason?! 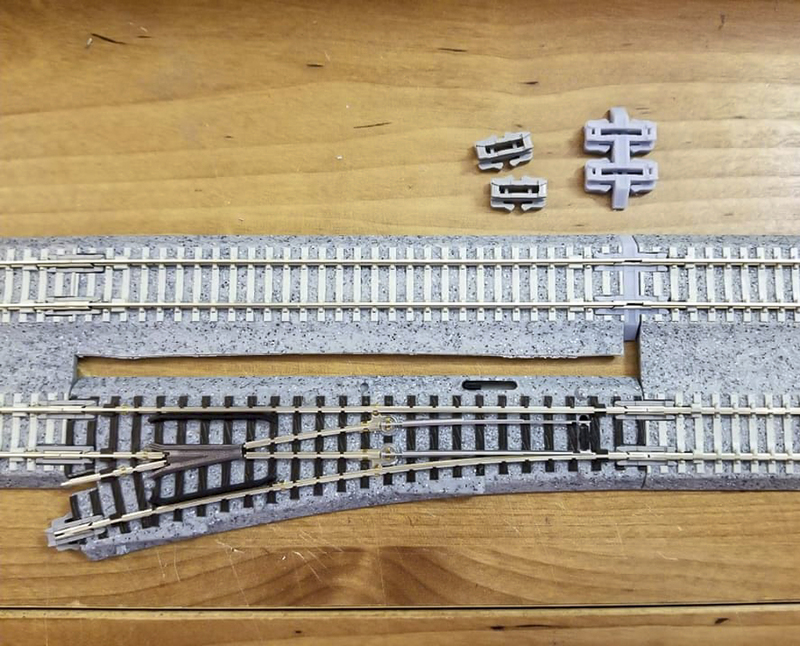 Plus you have to be careful with the 62, 124, and 186 mm pieces of the concrete double track as its apparently 1/2 mm shorter than the equivalent single wooden tie pieces. You could end up with not having enough overhang at the ends. 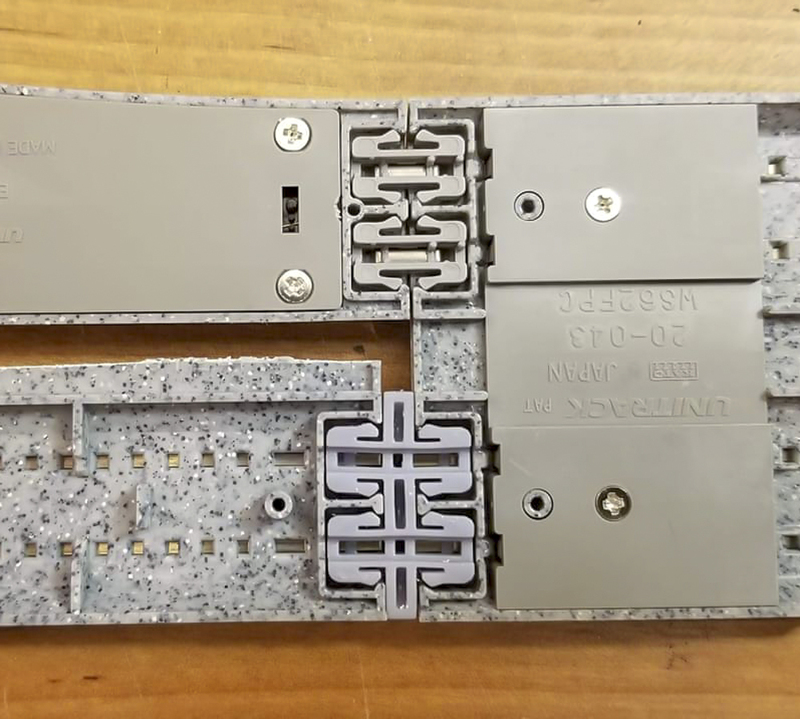 You could shorten the point end of the switch ? That would be pretty difficult if I wanted to keep the unijoiner pocket in tact though. We'll just have to apply some of that good ol' American Innovation! 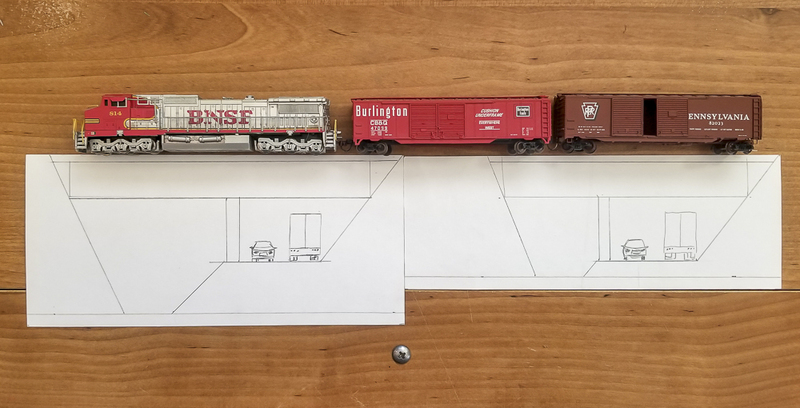 I simply modeled up a unijoiner, extended it 2mm and gave it some roadbed. That rail gap will be filled with rail cut from the unused 'notch' section, included with the #4s. 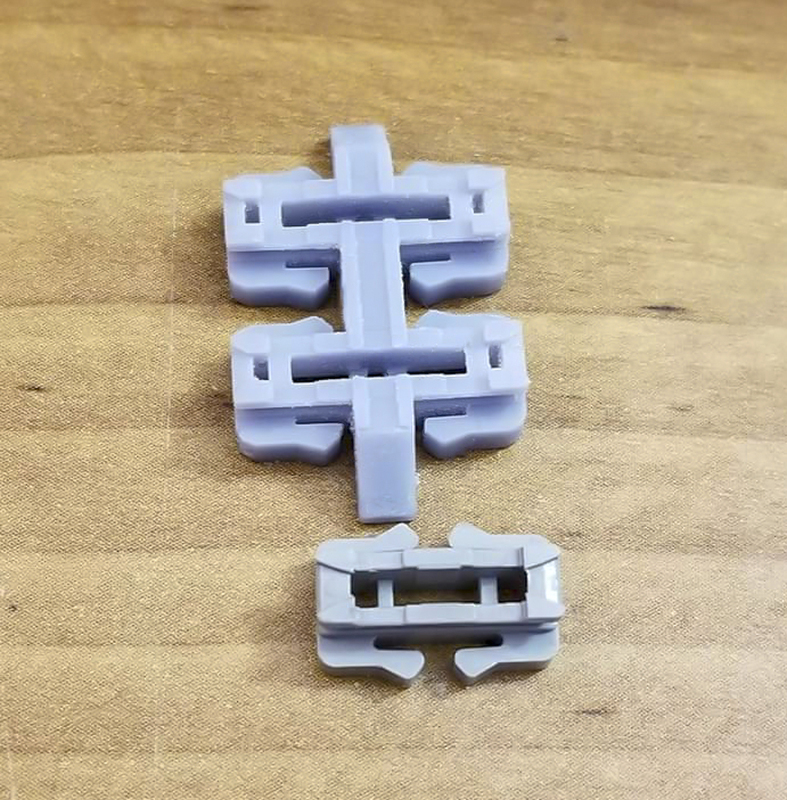 Now I just need my bridge sections!